Rubj The Actress – A talented diva, unconventional in her beauty and full of moxie. 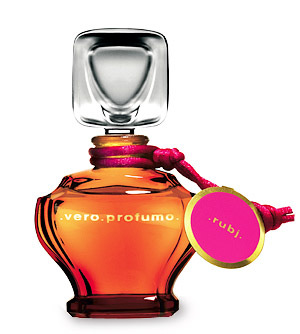 Vero Profumo is the brainchild of Swiss Aromatologist turned Professional Perfumer, Vero Kern. The three Extraits from Vero Profumo are an absolute joy to behold, each one displays a distinct character; Kiki is the cheeky Parisian, Onda is the stoic, yet fragile Matriarch and Rubj is the Actress. Unusual beauty appears to be a reoccurring theme amongst the three Extraits and none are more beautiful and unusual than Rubj. I see Rubj as an actress, a talented diva, unconventional in her beauty and full of moxie. She is the artist of the three, she appreciates the beauty in all things and whilst she may be hard to handle at times she makes up for it with vivacity and wit. I think Rubj was always going to be my favourite of the three offerings from this line, I am a sucker for a white floral after all, and Rubj is very different from a lot of the white florals I own, she is much more understated and glamorous. Rubj is proof that amongst a sea of mediocrity within the perfume industry, there are still perfumers and perfumes with the ability to surprise, thrill and move you. Rubj opens bright and indolic, she wears a trio of white flowers; orange blossom, jasmine and tuberose. The clean, fruity nature of the orange blossom rules over the jasmine and tuberose in the beginning and there is a clean mentholated quality to the flowers which is like crack to this white floral addict. She may be a serious artist but there is also something fun and fruity about Rubj. Fruit notes seem to have gained a bad reputation recently, probably due to the overflowing amount of sickly fruity florals on the market. But when a fragrance has a GOOD fruit note, well, there’s nothing better. Rubj opts for juicy ripe oranges to compliment her exotic flower garden. Like all actresses Rubj doesn’t give everything away and she keeps her cards close to her chest for a long time. After a while the strength of the white flowers resides and Rubj reveals a soft and sweet rose. Rose is the queen of flowers but her presence in Rubj is definitely understated, she doesn’t take centre stage, instead she adds softness to tame the sometimes harsh nature of white flowers. Luca Turin describes Rubj as “a pale, saline, but entirely comfortable accord of jasmine and rose” (Perfumes The A-Z Guide, p.480) and I agree with his assessment, although I would say she is anything but pale. Rubj’s unconventional beauty comes from this startling salty, and almost milky tone set deep within her heart, I see this as a soft side that lurks behind the glamour of the florals, only to be revealed behind closed doors. N.B. I chose Madonna as the accompanying image for this post because she embodies the idea of unconventional beauty, she’s not classically beautiful or exceptionally talented but she is fiercely intelligent and has that special something, that ‘star quality’ that makes her so fascinating. Also, it’s a great picture! Rubj is available in 7.5ml and 15ml Extrait. Prices range from approximately £120-£200. Posted in Floral, Perfume Reviews, Vero Profumo and tagged Floral, Jasmine, Madonna, Rose, Rubj, Tuberose, Unisex, Vero Profumo, White Floral. Bookmark the permalink. I literally had to run and squeeze the last precious drop from my sample of Rubj extrait to smell it while reading your review. I knew that she would be your favorite girl out of the three, as a white floral lover this is a homerun for you. But what astounds me is that I – as someone usually afraid of demanding divas – can love her so much as well. It goes to show that true beauty touches us all, no matter what our preferences. Vero Kern is a genius! Rubj is most definitely a home run for me, I love all three, and I think I will eventually buy small bottles of each. I would go for Rubj, then Kiki and then Onda. ‘It goes to show that true beauty touches us all’ – You couldn’t have summed it up more perfectly! I think Vero Kern has very cleverly made a beautiful, diva-like white floral that is understated, which is what makes it so unusual and wonderful. I keep reading brilliant reviews on all 3 of Vero Kern perfumes but have not yet managed to get samples of them, maybe today I may finally get my mits on them as they all sound divine. Your review made me want to try this one straight away despite the tuberose of which I am slowly coming round to, thanks by kilian beyond love. Divine is a good word to describe all three. I’m glad that you’re coming around to tuberose, it’s a beautiful note, but you have nothing to fear with Rubj, the tuberose is very subtle. They’re now available in the Roja Dove Haute Parfumerie in Harrods. I shall make a point of going there later this month then – having read B’s reviews of this trio and now yours, I am most curious about these, especially Rubj. There may be similarities with a couple of diva scents from Ajne like Bloom de Nuit, and I need to check them out! You do need to check them out, they are very lovely indeed. Bloom de Nuit sounds like something I must try, I love the name! Lurker deciding to join the discussion. 🙂 Love your blog. When I first tried the Rubj extrait, it reminded me of something long gone, but I just couldn’t put my finger on it. What was it???? At first I was thinking maybe it was Chloe Narcisse…but that didn’t seem right. Then after a few more tries, I had it – Jovan Black Orchid. Yup. A drugstore scent from the dark ages. Crazy, huh? Hoping someone else sees the connection. Rubj is a good one. Hi Karin! We fully welcome lurkers to join the discussion! Thank you for de-lurking and I’m glad that you’re enjoying the blog. I haven’t tried Jovan Black Orchid, but you have me officially intrigued, it’s funny how it’s always the cheapie scents that manage to stand up next to the über pricey ones! Thanks for the welcome, M! Unfortunately, the Black Orchid is long discontinued and not easy to find. Wish I could compare! Hope you can find some. I think it would be worth a sniff. That’s a shame, I will let you know if I ever find it. You absolutely must! If only I were about I would come and sniff them too! This sounds gloriously gorgeous, and makes me feel like I need to go put on more blush and buy some hot rollers! How very glam of you! ‘Gloriously gorgeous’ is a perfect description.